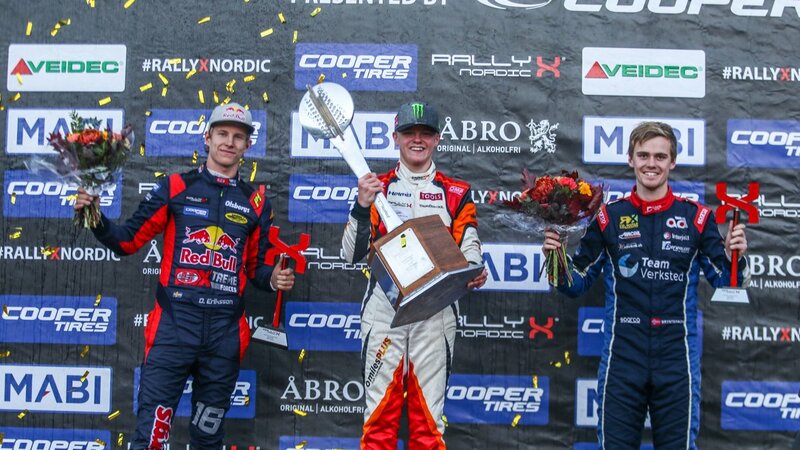 MELKSHAM, UK, 09 October, 2018 – Oliver Solberg has been crowned the 2018 RallyX Nordic presented by Cooper Tires Supercar champion after resisting the pressure of his title rivals to prevail in fine winning style at the Tierp Arena. 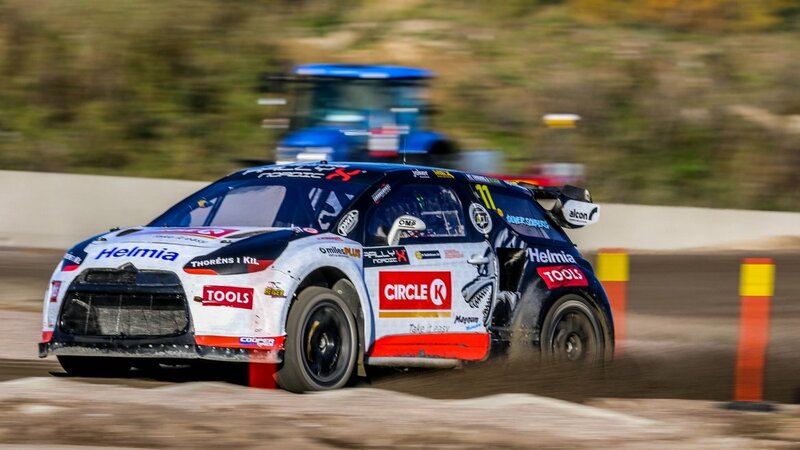 In front of 7,700 spectators, Solberg powered to a critical third victory of the season. Solberg, Oliver Eriksson and Thomas Bryntesson arrived at the Tierp Arena each with an opportunity to leave with the RallyX Nordic trophy, and the challenge of the all-new Swedish venue proved a successful leveller as the trio fought for supremacy over an eventful weekend of rallycross action. Starting the final from the front row, Solberg got the start he needed and survived the jostling into turn two to secure the lead. Seventeen-year-old Solberg – son of two-time FIA World Rallycross Championship title holder, Petter – kept it neat and tidy on-track to take the chequered flag and be crowned the new RallyX Nordic presented by Cooper Tires champion. In the 2018 overall driver standings, Solberg wins the Supercar title with a total of 148 points, 11 and 16 points ahead of Eriksson and outgoing champion Bryntesson. Guillaume De Ridder is this season’s Supercar Lites champion after accumulating the points he needed to defeat his closest rival Ben-Philip Gundersen before the final in Sweden. Sarah McRoberts, PR & Events Manager for Cooper Tire Europe, said, “Many congratulations to this year's worthy Supercar and Supercar Lites champions; we are delighted to be part of RallyX Nordic presented by Cooper Tires. Next season's expanded calendar, featuring seven rounds across five countries, will provide the perfect platform for yet more talented young rallycross stars to prove they have got what it takes to progress in their careers towards the FIA World Rallycross Championship - where all drivers also compete on Cooper tyres."